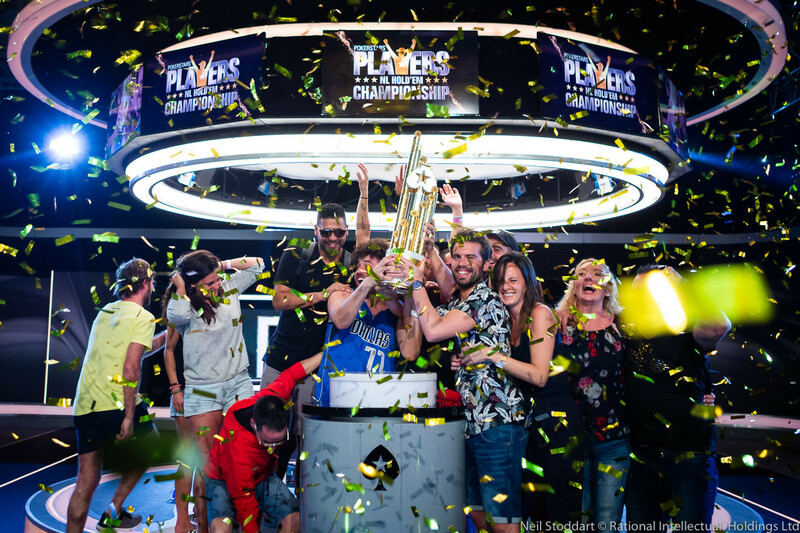 Hundreds of the most accomplished poker players in the world flooded into Atlantis Resort to hunt the incredible value created by the Platinum Pass promotion in the PokerStars NL Hold'em Players Championship, the biggest $25,000 event in the game's history. In the end though, Ramon Colillas, one of the very players whom they hunted, turned the guns around and made them the pelts on his own wall, emerging atop a field of 1,039 to claim $5.1 million in prize money. That includes $1 million added by PokerStars as the icing on this unprecedented promotional cake. Now, don't mistake the Spanish player for a fish totally out of water. While he had only around $10,000 in live cashes coming into the event, Colillas counts himself a professional player with half a decade of experience under his belt. The 30-year-old won his Pass grinding out points on a small Spanish live tournament leaderboard, and he's now turned it into the payday of a lifetime. Colillas had few expectations after winning his $30,000 package to The Bahamas. He knew he was coming in to face not only fellow Platinum Pass winners, but also some of the world's strongest no-limit hold'em players. "Only excitement, the best wishes and enjoying my stay," he said. Anything he actually accomplished in the tournament was gravy, and Colillas whipped together a batch that would have made any meal taste better just by advancing to the final day and final table of eight players, locking up half a million dollars. The last day looked to truly be anyone's game as nobody other than Marc Perrault was very short, and nobody was far enough ahead to feel any real comfort, including chip leader Scott Baumstein. One clear favorite emerged early on, though. French bracelet winner Julien Martini rocketed ahead of the competition with a hot run early. He got extremely lucky eliminating high-stakes regular Talal Shakerchi with ace-queen suited against aces and then polished off tournament grinder Farid Jattin with ace-king against ace-jack. The early stages of the final table were very good to Martini. Then, he proved it wasn't just the cards doing work for him as he pulled off a monster three-barrel bluff on Marc Rivera, the other Platinum Pass winner at the final table, who was caught in a brutal ICM vise with Perrault sitting on two big blinds. Martini had high hopes after moving into the big lead, particularly after the beat he delivered to Shakerchi. "When you win ace-queen suited versus aces in the first orbit, you're saying to yourself, 'This is mine,'" he said. Martini's position only improved as Perrault, Jason Koonce and Baumstein busted, leaving him three-handed with the two qualifiers and holding 60 percent of the total chips. Colillas was at one point down to 12 big blinds but doubled through his fellow Pass winner picking off an all-in semi-bluff with flopped second pair and holding against seven immediate outs and then a turned flush draw. Rivera would soon bust to Martini as well, but Colillas had collected enough chips to get up to 40 big blinds and only a 2-1 deficit, giving himself a fighting chance. The turning point came just about 10 hands into heads-up play. Martini flopped a flush against just second pair of Colillas, but the miniscule equity of the Spaniard came in as he called two bets and turned trips then rivered a full house. He checked the river and called right away when Martini set him in. "When he snap-called, I knew he had at least a flush," Martini would say afterward. "It's a big cooler but it happens every day in poker." Left with barely more than 20 big blinds, Martini ran dry on chips in about 20 hands, playing the Sam Farha role as Colillas turned himself into a modern-day Chris Moneymaker. In fact, Moneymaker himself was on hand to offer congratulations. "It’s amazing," Colillas said. "I’ve been following poker and poker history from a very young age. I was watching Chris [Moneymaker] on my computer when he made it; So now it’s a dream come true. It means a lot for me." While $5 million would appear to be a life-changing sum, especially for a guy with a used car worth of live cashes, Colillas doesn't expect much to change for him. 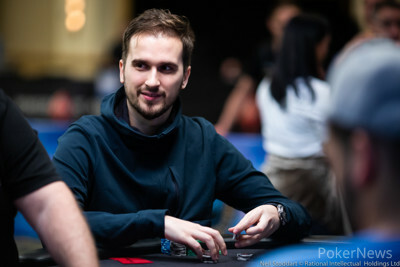 He'll play a few bigger tournaments now, including sticking around for the PokerStars Caribbean Adventure $10,300 Main Event, but other than that he said he'll likely be back to grinding his usual stakes in no time. "It's only about happiness and enjoying the moment," he said. Hand #102: Julien Martini shoved all in for 8,900,000 on the button with and Ramon Colillas asked for a count before making the call with in the big blind. It was nearly a flip with Martini's tournament life on the line. The dealer fanned the flop of giving both players a pair, but Colillas became a huge favorite to take down the title. The turn was the which changed nothing and Martini was down to just five outs. As the rail looked on in anticipation, the completed the board and Martini was eliminated in second place. Martini will still pocket $2,974,000 for his efforts but Colillas goes from Platinum Pass winner to $5.1 million and will claim the first PokerStars Players Championship trophy. Hand #97: Julien Martini and Ramon Colillas saw a flop for the minimum and Martini checked and folded with against Colillas' when the Spaniard bet 600,000. Hand #98: Colillas got a walk. Hand #99: Colillas gave a walk to Martini. Hand #100: Collilas got a walk. Hand #101: Colillas shoved on the button with and Martini called with for 4,150,000. The race went to Martini as it ran out , much to the Spanish crowd's disappointment. 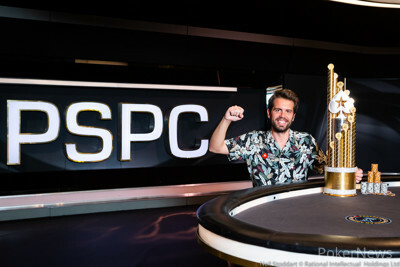 Hand #90: Julien Martini raised to 1,500,000 on the button with and Ramon Colillas defended from the big blind with . The flop came and Colillas check-folded to a bet of 1,200,000 from Martini. Hand #91: Colillas opened to 1,300,000 with and Martini called with a suited . The flop came and Martini checked to Colillas who continued for 700,000. Martini peeled one off and the landed on the turn. Both players checked and the completed the board. Martini led out for 5,200,000 and Colillas made a relatively quick call to widen his lead. Hand #92: Martini limped in with and Colillas checked his option with . The flop of gave Colillas a flush draw and he check-called a bet of 600,000 from Martini. The turn brought the and Colillas led out for 1,700,000 which got a quick fold from Martini. Hand #93: Colillas just limped the button with and Martini checked his big blind with . The flop fell and Martini check-folded to a bet of 600,000 from Colillas. Hand #94: Martini folded his button and Colillas was awarded a walk. Hand #95: Colillas elected to send his into the muck and Martini picked up a walk. Hand #96: Martini pushed all in for 5,050,000 with and Colillas folded . Hand #83: Ramon Colillas completed the blind with and Julien Martini raised big to 2.4 million with . Colillas conceded. Hand #84: Martini raised with and won the pot. Hand #85: Colillas raised to 1.3 million with and Martini woke up with and called. Colillas bet the for 800,000 and Martini mucked. Hand #86: Martini raised to 1.5 million with and Colillas called with . Colillas checked the flop and called 1.1 million. They checked the turn and Colillas bet the river for 2.4 million. He folded out the chop. Hand #87: Colillas shoved with pocket threes and Martini mucked . Hand #88: Martini raised with to 1.5 million and Colillas defended . On the flop, Colillas check-folded to a continuation-bet. Hand #89: Martini got a walk. Hand #81: Ramon Colillas limped in with on the button and Julien Martini raised to 2,000,000 with in the big blind. Colillas laid his hand down and Martini took the pot. Hand #82: Martini raised to 1,250,000 with and Colillas laid down his rags in the big blind. The two players are taking a scheduled 20-minute break with the blinds increasing every 30-minutes when they return. 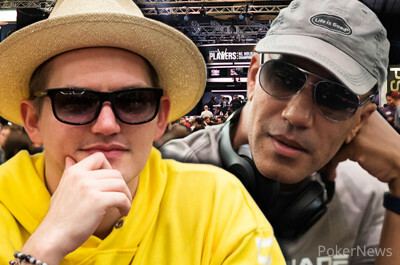 Thursday morning at the PokerStars Caribbean Adventure in the Bahamas, Joey Ingram ran a almost three-hour long live Poker Life Podcast session with guest Bill Perkins. Those are words that many never would have guessed they’d hear, given Ingram’s contentious history with the online poker giant. Before the podcast got underway, we talked with Ingram about what lead up to him showing up at PokerStars' flagship event. Read the interview with Ingram and get the highlights from the Poker Life Podcast with Bill Perkins over on the PokerNews homepage.